Starting with the London Underground in 1863, why are so many metros/subways built underground (as opposed to en elevated metro)? This requires a lot of digging and excavation, which to me seems a lot more expensive than an elevated metro like the Chicago L.
Paris, New York, Moscow, and others have also chosen underground metros. So there seems to be some almost universal reason of history. In fact the only major metro that's above ground, that I'm aware of, is the Chicago L.
Why was this? Was there no alternative? To me it seems an elevated system would cost no more than a bunch of bridges brought together, whereas big tunnels underground must be hugely expensive. Was it something besides costs, such as the streets simply being too narrow for at-grade or above-grade system? Was there no good bridge-engineering in the early 20th century? Or is digging those tunnels somehow cheaper than an elevated system? Edit: Because there is so much info here, I opened a related question about Why Chicago chose an L.
In Moscow under former mayor Yuriy Luzhkov it was built a line (Butovo line) which is mostly elevated. I think the practice was not considered quite successful as a result. The elevated line still consumes ground area. Even though one can lay highways and streets under it, one has to demolish buildings. Not much different from a ground-level railroad actually. That said, the Butovo line was built at the city's outskirts, where the land was more cheap and had less buldings (especially, historically important ones). Greater levels of sound pollution. The extensive sound shields installed on the line were still unable to completely isolate the surrounding area from noise. Residential buildings have to keep a similar distance from this line as from any railroad. The need for special roll stock. It seems that the carrige park started to wear off much quicker than at underground lines and required special climate protection. 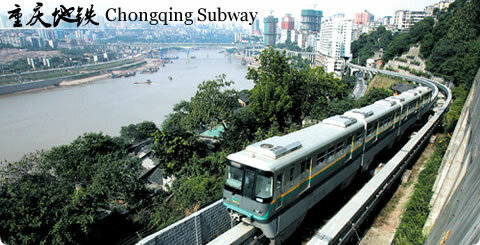 The same roll stock is impractical to use on the both elevated and underground lines, which adds logistic troubles. In summer the trains on the elevated line need conditioners, while at winter they require a heater. Higher maintenance costs. The tracks need better care due to seasons. This includes cleaning of snow and ice of both rails and platforms and increased rail expansion due to different temperature in summer. Also, increased corrosion due to rain. Higher construction costs. Overall, the cost of construction turned out to be $34M/km compared to $30M/km for cut-and-cover underground lines in Moscow and $22M/km in Kiev. This difference includes the need for specialized roll stock though. That said, there is also a system of electric commuter trains in Moscow, so-called "elektrichka". They are mostly ground-level, share the track with intercity trains and the lines may go far into Moscow region beyond city limits. But inside the city they can be used the same way as metro, and often are cheaper. This is mostly about urban planning, and how much change the local government can or will be able to make to the existing streets. In London, the central parts of the city (Westminster and the City) still have their street plan from medieval days, as the 1666 fire didn't burn the foundations. The streets there are far too narrow, and the buildings too important or politically unchangeable. When industrialization came in the 19th century, the trains couldn't go all the way into town. If you look at today's mainline rail maps, all of the stations are at the outskirts of the City. The only remaining way to get trains in and out of central London was to put them underground. That said, once you get out of central London, the London Underground trains run overground, and occasionally on elevated tracks. Once they were out into the suburbs, it was possible to get planning permission for tracks and stations above ground, and that's what happened because it is much cheaper. The same is true for Paris, Moscow and New-York. In all of these places, the city existed long before the trains did. Because of that, the trains were built in afterwards underground. Since Chicago grew into a city after (or at least during) the industrial revolution, the city was planned and built to include the trains, or at least space for them to pass through where no historical structures stand. Because the trains weren't added to the city, but planned into it, they had the option of building them above ground. For New York, the answer is related to real estate value. In New York City, the construction of the metro was performed by real estate developers. The idea was to build homes, then connect them to the city with a subway. Sales of the new homes, in principle, then funded the metro system. Above ground trains were not conducive to high priced luxury apartments. Prior to the subway, Queens Boulevard had some small communities an a bunch of farms. The construction of the IND Queens Boulevard line coincided with a bunch of new suburban communities, with high rise apartments at express stops like Forest Hills and Kew Gardens, and smaller developments at other stops. Wikipedia mentions a property value increasing from $1,200 in 1925 to $10,000 in 1930; I think while this figure shows investments earning 10x in just a few years, this was just the tip of the iceberg. There were 21 new stops on this subway, each with more than a few mile of intensive real estate development. In Kings County, elevated railroads were also built by several companies, over Lexington, Myrtle, Third and Fifth Avenues, Fulton Street and Broadway. These also later shared trackage with subway trains, and even operated into the subway, as part of the BRT and BMT. Most of these structures have been dismantled, but some remain in original form, mostly rebuilt and upgraded. I've always found it astounding when cities in the US actively destroyed parts of their transportation infrastructure. Typically, at least in New York City, the motives for many things related to real estate prices. Evidently, the increase in value of properties along these routes would increase if the elevated tracks were removed, so TPTB decided that they should be removed. Some were replaced with subways, some were replaced with buses, and some with private cars. As mentioned in the comments, there are still some elevate lines, for example the number 7 train in queens, and the N train in Astoria, and the number 2 train in the Bronx. These areas were historically cheaper than the more expensive, and prestigious areas of Manhattan. Thus most of Manhattan put the subways underground to further increase property values. If things haven't changed to much, the only elevate line in Manhattan is around Washington Heights, where property values are cheaper than the Upper West Side or elsewhere. Chicago is a great city - go Cubs! But it is not in the same league as New York, London, Moscow, Paris, and Tokyo. The urban core is much smaller, there are a lot less people, perhaps 1/4 or 1/3 the population of New York City. What is interesting about Chicago is that they retained their elevated system. Los Angeles, Detroit, St. Louis, and a bunch of other cities had elevated systems and streetcar systems before the 1950s. These systems were all town down by General Motors, and replaced by bus lines. How did the Chicago "L" system survive? Perhaps Chicago was big enough to need the system? I am not 100% certain, but it appears that because of financial trouble in 1932, Chicago Edison Electric Utility divested control of the "L" prior to the Public Utility Holding Company Act of 1935. The city between 1932 and 1935 must have started to begin to gain control of the system, and eventually developed the CTA which took control in 1940, insulating the system from destruction by GM. It is likely a combination of Chicago being larger than St. Louis and L.A. at that time, and the growth the CTA that saved the "L" from destruction in the 1940's. The reason most of it remain above ground likely related to it being historically much less expensive than Manhattan. I'll see if I can find a source to corroborate this thought. Noise, vibrations, and visual impact drop the value of the nearest houses, and decrease quality of life for its inhabitants. The maintenance of an elevated system is expensive, not only economically but also in terms of streets closed to traffic for performance of maintenance work. Quite often subway lines are built to relieve traffic pressure on areas where there is no room to add more roads, including the towers needed to allow for the creation of elevated roads or railways. In fact, if you look at cities with subways, almost all of them have the tracks come above ground and continue as a sort of light railway at the point where the suburbs were under construction by the time they started constructing the subway system, precisely because it's so much less expensive to build above ground, and when they can do that while planning a suburb around the new metro/rail line they will. London does it like that, as do Amsterdam, Munich, and many others. I can add that Washington DC is still expanding its Metro and the expansion is not underground. The newest line is the Silver Line, and as it goes through Tysons Corner it's almost entirely elevated. There was a loud grassroots movement to put it underground through Tysons Corner, but underground is much more expensive and risky. The arguments against elevated lines echo what has been said in other answers: unattractive, extra maintenance and problems due to weather, and so on. An additional argument is that it's built along the middle of a couple of major roads that already make the area pedestrian unfriendly, and so it will always be an anchor against the ultimate goal of remaking Tysons Corner more of a mixed-use, pedestrian-friendly place like nearby Arlington. EDIT: To add a bit more history, Arlington came up with a plan where the densest construction and highest buildings would be along the (underground) Metro line, falling off a bit between stops, and falling off quickly as you move away from the Metro line entirely and towards single-family-home neighborhoods. It hasn't totally followed that plan, but it's worked very well, and part of that is because you can build right on top of an underground Metro. So it's not always the case that you need underground because of pre-existing buildings that can't be touched: it allows a lot more room to build new tall buildings along your route. In Berlin, Germany, there is - as said before - a mixture of underground and overground services. The reason here for not using underground in some areas is the consistency of the soil / kind of ground. So its an engineering reason. There is a city Chongqing in central China, there are two big rivers & lots of rocky mountains so for some districts it was too difficult/too expensive to build underground metro (or "undermountain" metro) so some line are almost elevated. The Metro in Moscow is underground (and is especially deep) because it was a dual purpose structure that would have been used as a shelter in case of a nuclear war. At least that's what I heard when I lived in Soviet Union. The decorations there were also very special and intricate to impress normal people with the Soviet future. Not the answer you're looking for? Browse other questions tagged 20th-century 19th-century transportation engineering or ask your own question. Why did Chicago and other cities choose an L (elevated metro) when most others chose underground subways? What did Germany do after World War II to recover so successfully that it became more prosperous than its WW2 victors?